The title of this book gives the impression that it covers the escape attempts of captured military personnel during WWI. 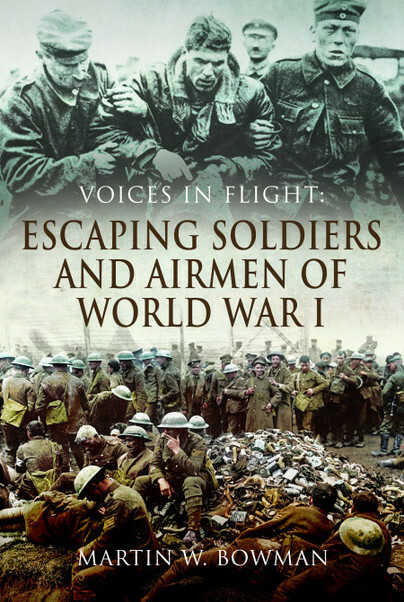 A more accurate title would be "Airborne shenanigans during WWI", admittedly this is not as eye-catching a title; but what 'escaping' there is, is tucked up nicely in the last few chapters of the book. What you have to read to get to that point is however a fascinating insight into the personal exploits, predominantly of airmen - not soldiers, during the conflict. I enjoyed the entire book and was constantly struck by just how far we've come in 100 years of aviation [military] and in comparison what was considered acceptable then to today. For example during the first 5 days of the Battle of Arras, the author tells us that 75 aircraft were lost and 105 aircrew - a figure unthinkable today and sobering to consider. When I opened this book my eyes felt assaulted by the walls of text on each page. This may sound like a silly criticism but the typesetting felt very cramped on the page. I'm sure the author is not to blame for this but it did look like someone had taken an un-formatted document file and bound it into a book. This did surprise me as no other book I have from Pen & Sword Publishing (P&S hereafter) has this style of typesetting. The publishing quality of my other P&S books is very high, maybe they had a page limit to fit this work into ...? Each chapter opens with a short excerpt from a personal journal or what I assume to be official dispatches from the front or other such source. Then the author goes on to give the context and throughout each chapter reveals more of the personal account or event. I found this style of having two voices in a chapter engaging. The chapters finish with a note section, rather than at the end of the book which allows for much quicker lookup of the referenced material. I am professionally aware of military aviation and have spent countless hours surrounded by pictures of old planes from the Royal Flying Corps and the Royal Naval Air Service. There were more than a few occasions throughout this book which jogged old memories of reading medal citations contained within squadron display cabinets. I was very grateful to the author in fleshing out each account and providing the sources and more of the back story as much as he did. There were still many stories of which I knew nothing and I was surprised at the seemingly, ubiquitous role the formative RAF had in WWI. One of the most poignant chapters involves the story of Reggie Marix, who after capturing a German cavalry captain and confiscating his sword, offered the POW his pistol in order to end the suffering of his stricken horse; an honour that Reggie thought the German should still have. The chapter goes on to relate how the confiscated sword found its way back to the German many years later and is quite touching. This example, and several others throughout the book, hark back to the days of chivalry and honour which arguably has disappeared from modern battlefields. I think this book would be enjoyed by a relatively wide audience, although convincing the wider audience of that would be a challenge. If you're not interested in military history then nothing on the cover suggests that a person that only reads biographies would also enjoy it. The book's focus is on individuals and their personal stories in which they are, to me at least, doing amazing things. It's not a historic retelling of the tactics or strategies of WWI but focuses right down at the lowest, human level. In our time, these gentlemen would be celebrities in their own right and lauded for their courage, tenacity and skill. The reader is free to draw their own conclusions to how the majority of today's 'stars' stack up in comparison. If you would like to pick up a copy of this title, P&S currently (Aug 2017) have a sale on it. However I will just link to their store page and the RRP of £25.00. I highly recommend this book.